Selma is the gripping biography of Dr. Martin Luther King Jr. This is how biopics are best told--intimate, personal, affecting, a behind-the-scenes dirt-and-all look at an important icon in American history without pandering to hero-worship or scornful criticism. 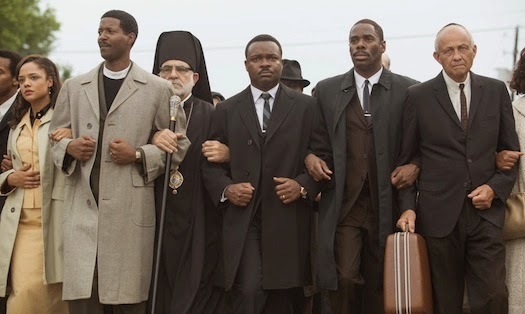 Rather than attempt a sweeping story of King's entire life, Selma focuses on a particular moment in his life: the fight for voting rights for the black community and the subsequent demonstration and march from Selma, Alabama to the capital of Montgomery. Selma devotes all its energy to the actions and characters within this short period of time, and its better for it. This choice in storytelling allows for a focused narrative and increased depth in the characters--we are given an "inch wide and mile deep" instead of a "mile wide and inch deep." So many scenes from Selma are etched in my mind: the startling opening scene with four little girls in a church; the 84-year-old grandfather crying over the death of his grandson; the intimate kitchen conversations between Martin and Coretta, especially when she asks him if he truly loves her; the Edmund Pettus bridge leading out of Selma and the battles waged upon it; the heated argument between president Lyndon Johnson and Alabama governor George Wallace; the speeches King gives throughout the film, but especially in the finale. These scenes come together as a compelling and affecting narrative. Filmmaker Ava DuVernay uses just the right amount of sentimentality without becoming mawkish; the tone of the film is haunting, genuine, and inspiring, and its message feels weighty without being heavy-handed. Oyelowo is simply extraordinary in his portrayal of the American icon. He wholly embodies the spirit of King, especially the speeches and preaching. There is a power behind his voice, and no wonder people were either passionate followers or outraged detractors. One couldn't hear King's words and remained unmoved or apathetic. My heart raced, my eyes wet with tears, and King/Oyelowo's pleas and exhortations washed over me like a baptism into a rolling stream of justice. And Selma doesn't even show the historic "I Have a Dream" speech or the compelling "Letter from a Birmingham Jail." It would be a challenge for an actor to take on a role like this, carrying the mantle of a man who dramatically changed the course of American history. Oyelowo's performance sits alongside Daniel Day-Lewis's portrayal of Abraham Lincoln or Ben Kingsley as Gandhi--exemplary acting honoring exemplary men. In Selma, he is both confident and humble, a leader of a movement but also an ordinary man who was in need of encouragement, as he had been fighting for civil rights for nearly a decade at this point. He's a human being, a husband struggling to maintain the health of his marriage, a father who misses his children, a friend, and a pastor driven by his obedience to Christ. This latter point strikes me as significant--Selma is a "Christian" film in the best sense of that term. It doesn't edit out or avoid the impact of Jesus Christ on King's decisions. Selma portrays Christianity in the best possible light, offering a real-life example of people who are compelled by obedience to Christ to stand for justice and work diligently to love our neighbor, regardless of location or race. When King calls for people who care about racial equality to come join them in Selma for the march, clergy of all types flock to the staging grounds, ready to walk alongside King and Christ for the movement of justice. Near the final act of the film, a worried security officer is worried that he cannot protect King if he chooses to walk into the Alabama capital. "Aren't you worried about your own safety?" he inquires. King's response is remarkable: turning aside and shot from over his shoulder as he looks through a dusty window, he replies, "I am not different than anyone else. But I must be obedient to God." His life is a compelling picture of vocational fidelity and commitment to doing justice, loving mercy, and walking humbly with God. Selma is a powerful film, a haunting film, and an important film. It's a must-see for pastors in America as we look to examples like Dr. King to be our prophets and the voice for justice. This sounds painfully obvious, but it must be said: racism is still a significant problem in America, and the church has not always been at the forefront of standing for compassion and change. Selma reminds us that the church can be a healthy force of compassionate good, a promoter of human rights and social justice in our society. Striving for racial equality and freedom is often an uphill battle filled with casualties, but it's a battle worth dying for. Selma points us to the glory to come, a picture of hope in the darkness of racial tension and systemic injustice.